The first day of fall is September 22nd and I’m so excited that summer is finally over! As you probably know by now, fall is my absolute favorite time of the year. I love anything with pumpkin spice so I created this dog treat recipe for Frozen Pumpkin Spice Dog Treats. This recipe is similar to our popular Frozen Apple Dog Treats. 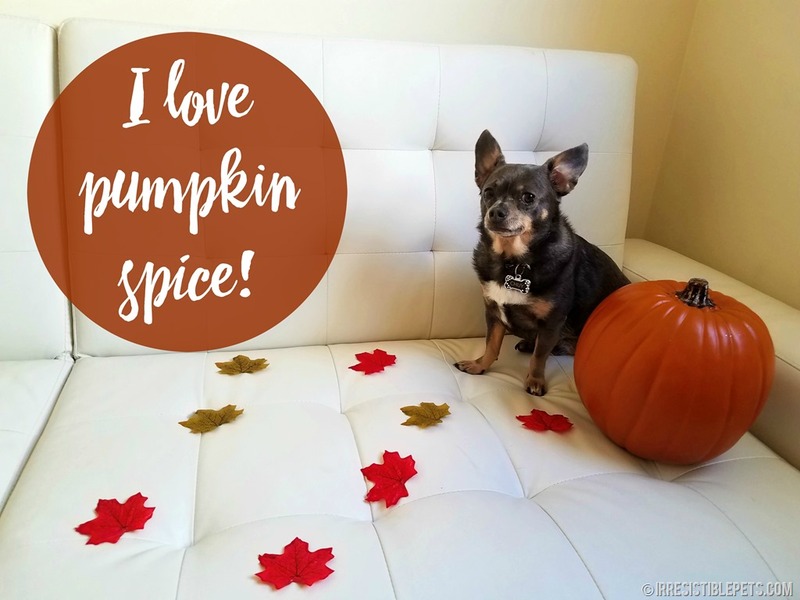 If you love the fall season and pumpkins, be sure to also check out our posts, 10 Reasons Why Fall is Irresistible for Dogs, Fall Bucket List for Pet Parents, and Irresistible Pumpkin Recipes for Dogs, and The Ultimate Guide to Frozen Dog Treats. Measuring Cups. I got my cute cat shaped measuring cups at Home Goods. Ice Cube Trays. I used regular trays and a pumpkin shaped ice cube tray. 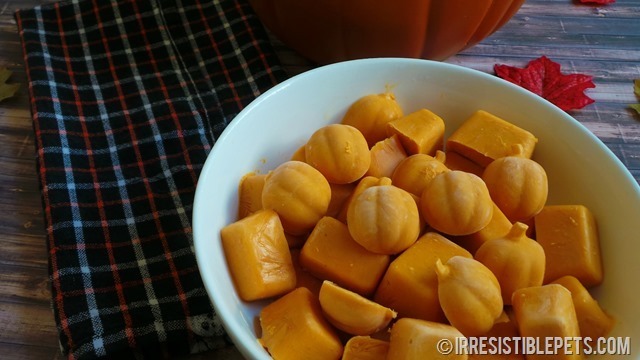 This recipe makes 16 treats if using a standard ice cube tray. Double the recipe if you want more. 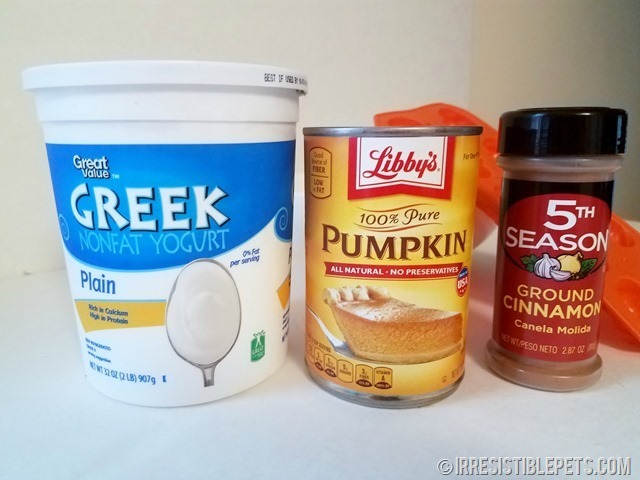 1.Mix the yogurt, pumpkin, and cinnamon, together. Add a few drops of water as needed if the mixture is too thick. 2. 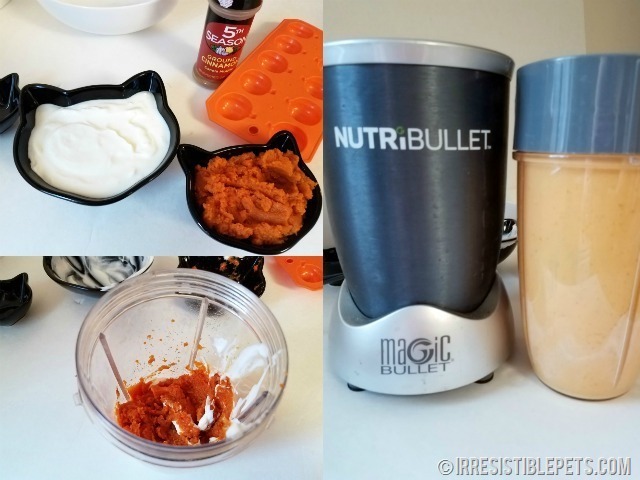 Blend everything together in the NutriBullet or a blender. Blend until you get a liquid consistency. 3. Pour the mixture into an ice cube tray and freeze for a few hours or until frozen solid. TIP: To make it easier to pour, I put the pumpkin spice mixture into a plastic bag and cut a small piece off the corner. 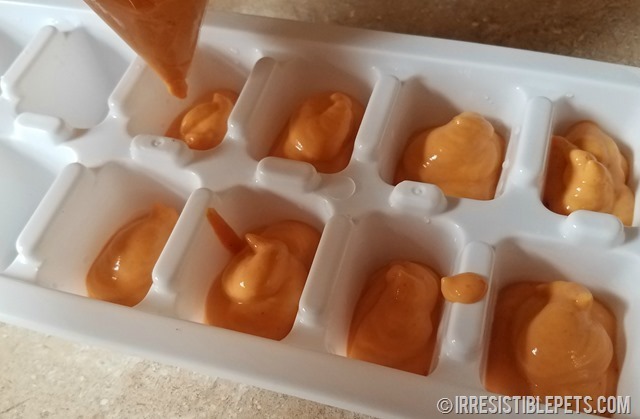 This method is so much easier than spooning it into the small ice cube tray! 4. Freeze for 3-4 hours or leave them in the freezer overnight. I recommend only feeding your dog one “cube” at a time. You can put the left over treats into a Tupperware container or zip-lock bag and store them in the freezer. As with any new treats, always consult your veterinarian before introducing a new food into your pet’s diet. 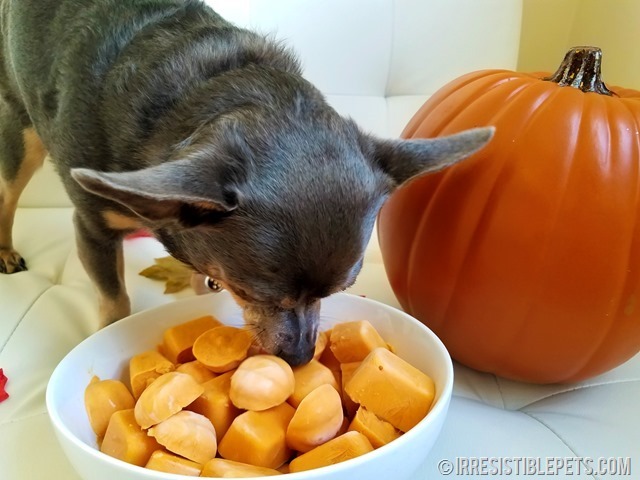 Chuy absolutely loves these treats and anything pumpkin flavored! I love making home made treats because I know exactly what’s in them and I know that they are healthy for Chuy. Chuy was patiently waiting to test the pumpkin spice treats . . . The benefits of a blog photo shoot . . . Chuy thought he was getting the whole entire bowl. Nope! He licked the top and I gave him one to test. Ok, maybe two! 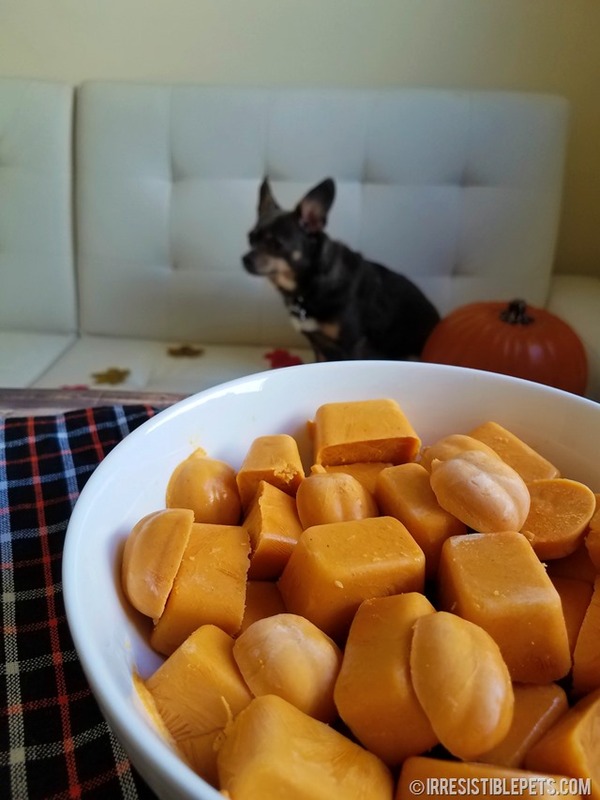 Will you try these pumpkin spice dog treats? Let us know down in the comments below! If you love this recipe, you’ll love our Frozen Apple Dog Treats. I also recommend that you check out our list of Irresistible Pumpkin Recipes for Dogs and our list of dog treat recipes. These look fabulous, what a perfect Fall treat for the dogs. I will definitely try these, I’ve been doing a few DIY dog treat recipes myself, very simply ones! 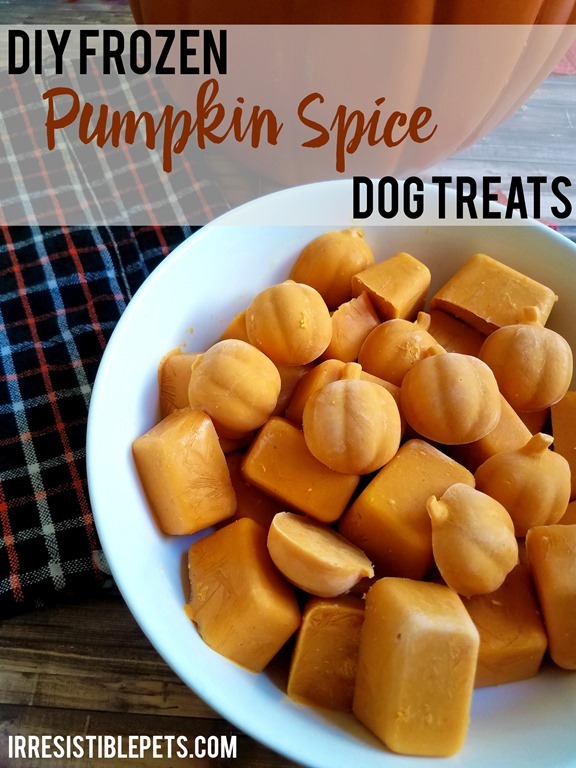 I will try these for sure, my dogs LOVE anything with pumpkin! Thanks for sharing! If it’s not simple, I won’t make it! LOL Hope you try these out! Delilah would love these, thanks for the recipe! Glad to hear that. I hope she enjoys them! Just started making homemade treats for my fur babies. I will try these. Awesome! Isn’t it fun making treats for your babies? Love this recipe! Gonna try it tomorrow. Thank you for the recipe!! Chuy is so cute!! Such a great innovation! So very excited to make these for my pup! Although Halloween is over, it is never too late for treats and pumpkin spice! Thank you for sharing such an awesome recipe! It’s always a great time for pumpkin spice!